For teachers who have used paper for many years, digital reading may seem more like a distraction than an opportunity. Why bother to introduce a new electronic medium when teaching with paper seems to work? The advantages of reading on a digital platform may not be obvious, while the potential costs to the teacher in terms of money, time, and loss of control and student attention may loom large. The resistance to adopting a digital reading platform is understandable. Paper texts are intuitive, safe, and widely used. But they also limit how deeply your students read and how effectively you can teach. Over the years, several studies have claimed that reading on paper is inherently better than reading on a screen. However, the type of reading that is generally evaluated in these studies involves reading a static PDF or scrolling through a webpage on a smartphone. We want to challenge reading on paper by presenting a new way of reading digitally. Actively Learn was born from a teacher’s frustration with the limitations of paper-based texts. Paper limits the teacher’s role in guiding student reading, delays the conversation around the text, and reduces a student’s ability to make connections between passages and texts. When teachers assign paper texts to their students, they start the class not knowing whether students have read the text, whether they’ve understood it, and whether they’re ready to discuss it. 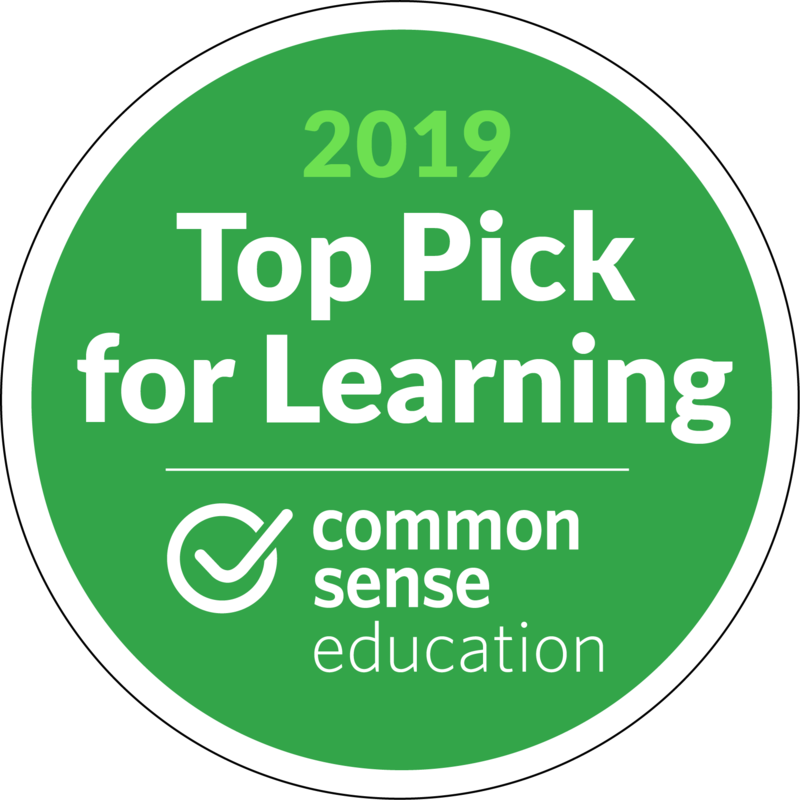 We drew on research into how students learn best and realized that teachers can be much more effective in their instruction by going beyond paper and exploiting the opportunities provided by digital reading. Let’s look at a few ways that Actively Learn can transform what teachers are able to do in the classroom. Paper-based teaching emphasizes only one aspect of reading: the end result. It does not see the process of reading, but rather assesses what the student took away from the reading after he or she finished the task. This is because the only way to reflect the student’s reading in a paper-based classroom is to follow up with students after they have already put the book down. Teachers may assign comprehension questions or have an in-class discussion about the text, but these interventions only take into consideration the end result of what the student has read. The problem with this scenario is that the actual process of reading is lost. Research into effective feedback and assessment demonstrates that the most important aspect of deep learning is understanding the discrepancy between students' learning goals and their current state: students need to know how to become better thinkers and readers so that they can improve their strategies and process. The majority of classroom assessment, however, is focused not on providing them with insight into how they learn but rather determining their level of proficiency. Knowing whether students got the question right or wrong is far less valuable to the learning process than understanding what they thought as they read. Paper-based teaching fails to teach students the practices of good readers: engaging with the text, asking questions, challenging assumptions, and making connections. Teaching students the actual skills that allow them to become effective lifelong readers requires tracking their thoughts, responses, and questions as they unfold and making them accessible to the teacher. To teach reading as a process, teachers need to guide and promote the student’s thinking as he or she reads. This can only be done with technology. We’ve designed Actively Learn to focus on reading as a skill. Our platform promotes the practices that characterize deep reading: annotating, engaging with the text, asking and answering questions, and making connections across texts. We allow teachers to read alongside students and get insights into how students are processing the text. An example of a teacher gaining visibility into student reading by asking them to annotate specific points of the text. Digital reading allows teachers to do what was once the exclusive purview of private tutors: understand the individual student’s reading process. Teachers can provide the one-on-one attention that is otherwise impossible to give in a classroom of 25 students. They can stop students at a given point in the text to ask a question, check in to see whether the student is making connections to previously-discussed ideas, and read through the student’s annotations to see what he or she is thinking as he or she reads. 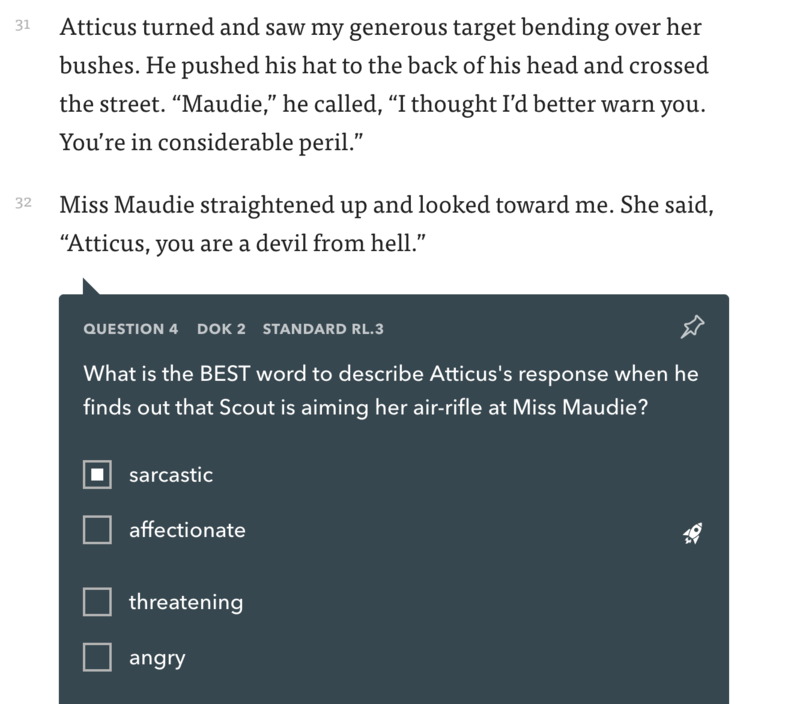 Teachers can also model deep reading by creating annotations for students, embedding hyperlinks to other texts and media, and asking provocative questions in the margins. This level of attention is critical to improving the process of reading. The benefits of this are manifold: when students learn how to read deeply, the experience of reading becomes meaningful and enjoyable for them in and of itself. They no longer see reading as a means to an end. They understand what it means to engage with text and read critically and analytically. These are skills that will take them far beyond the walls of the classroom and enable them to be lifelong readers. With digital reading, teachers can emphasize reading as a process and focus on building the essential skills of deep reading: entering a dialogue with the text, asking and answering questions, and making connections. Teachers can diagnose reading problems that are impossible to see with paper texts. Students learn what it means to read deeply and acquire the skills to be lifelong readers. With paper-based texts, students are alone as they read. They may not know what aspects of the text to focus on. They may not be making the connections that the teacher wants them to make. The student might be scanning the text and asking, “Why am I reading this?” The answer to that question may not be clear until the next class, and by then it’s too late. In this scenario, reading loses its meaning for the student. If the student doesn’t know what to think as he or she reads, then reading ceases to matter. The cumulative effect of this year-after-year is devastating for student learning. “Constructing meaning requires readers to set purposes for what they read and to actively monitor whether or not those purposes are being met. This implies a strategic effort on the reader’s part, and that is where teachers comes in." Well-intentioned teachers may provide a set of questions to guide student thinking. But because these questions are outside the text itself, their role in the student’s sense-making is necessarily limited. Teachers cannot embed their questions inside the paper text and guide the student as he or she reads, at just the right place in the text. Attempts to signal to the student which lines of text are most important or to stop the student at a particular moment to ask a question are necessarily cumbersome and distracting when using paper. Only digital text enables teachers to provide immediate, adjacent guidance to their student readers. 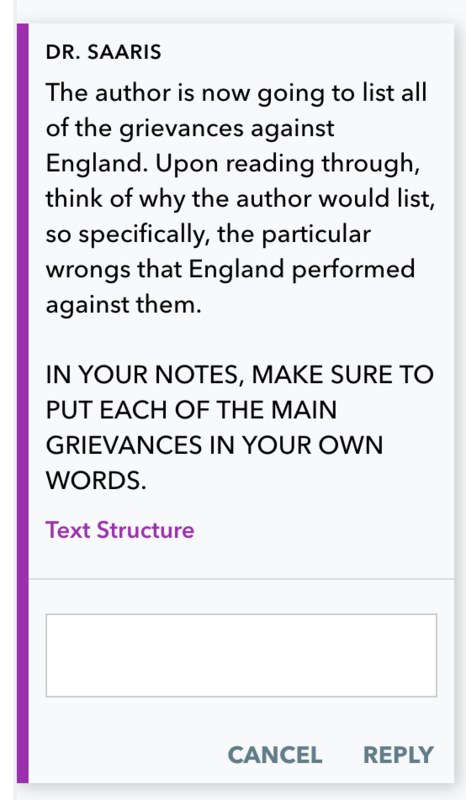 Embedding notes in the margins of the text lets students know what they should be thinking about. It allows the teacher to read alongside the student, point to particular sections of the text, and make connections that are relevant to the goals of the course. The teacher can stop the student at a given point in the reading assignment and ask a question. Joe Romano, a Library Media Specialist, notes that after switching to Actively Learn for assessment and reading, "my students are responding even more directly to the text and using the text in their responses more than they ever would. Each and every student is allowed to offer insight about a particular moment in the text, and I’m able to gain a greater understanding of individual student understanding." Digital reading allows teachers to foster a dialogue between the text, the student, and the teacher, effectively turning reading into a guided, focused activity. Students know what they are supposed to get out of the text and how it relates to the goals of their course. Teachers can focus student reading to clarify the intention of the assignment and encourage the student to make the desired connections among ideas as he or she reads. The teacher can effectively be present as the student reads. For the student, this removes the seeming futility of the isolated reading assignment and integrates reading directly into the ongoing conversation of the course. The most challenging aspect of class reading for students and teachers is “transfer,” or the ability to take previously-acquired knowledge and use it in the future to make connections across unfamiliar ideas and texts. For many students, the obstacle to recontextualizing and repurposing their existing knowledge is lack of storage and searching. Think of all the information that a student acquires across all of his or her classes, and how difficult it is to keep track of. As students read a paper text, they may vaguely recall a concept from their prior reading that relates to the text at hand . But in order to revisit that concept, the student would need to retrieve the prior paper text and scan through his or her notes to locate the record of that idea. This is a time-consuming and cumbersome process that few students bother to pursue. Digital texts solve this problem by storing student notes, questions, and peer responses and making it easy to search through them. Revisiting prior knowledge is as easy as clicking and typing a search term. Not only can students themselves look through the record of their prior learning, but teachers can help students connect ideas by embedding annotations and links in the text. As the student reads The Cask of Amontillado, he or she sees a question about how Montresor’s notion of revenge relates to The Count of Monte Cristo. To refresh a student’s memory, the teacher might include a link to a short YouTube scene from The Count of Monte Cristo or link to a synopsis of the plot. These connections are much easier to make in a digital text. Students can easily access their previous notes, questions, and responses in a digital format, which makes it convenient to make connections between existing knowledge and new material. Teachers can help students connect ideas by including annotations and links inside the text. This models the analogous thinking that is critical to deep knowledge. We know that deep learning is an interactive process that involves asking questions, making connections, and communicating ideas. With paper texts, reading is preparation for the deep learning that only begins once the class reconvenes. It is only once that paper text is integrated into class discussion and brought into dialogue with other ideas that deeper learning takes place. At Actively Learn, we want deeper learning to be a part of the reading process. We want students to enjoy reading because they see it as a collaborative activity that is relevant and meaningful to them. We want teachers to be present in the text as students read and guide their thinking and discussion. Finally, we want students to be eager to arrive to their next class in order to continue the conversation that is well under way when the bell rings.